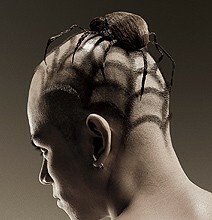 Hair sculpting just reached another level in creativity. Bench, a hair styling product company from the Philippines, has launched an ad campaign featuring some of the wildest hair styles you’ve seen. The company claims their product offers superior hold and these lizard and spider hair styles must surely need it.